International Connections among Scamming Gangs. There will be some near you, unless you live in the Antarctic. Internet Scammers, that is. They are a Global phenomenon. All successful Scammers are devious, but the advance fee fraud Scammers (many based in West Africa) really excel at it. At one time, it was from the keyboards of their cyber cafes that these miscreants sought their Victims. Increasingly now, they have SmartPhones and Tablets and work from their homes, street corners, just about anywhere with a mobile network reception. Once a Victim is hooked, the traditional methods of extracting payment are money transfer services (Western Union and MoneyGram) or bank transfer. But not always. Sometimes, it is in the Scammer’s interest to send someone to meet the Victim and collect. That’s where his international connections come in handy. Imagine that you have been hooked and are deep into a complex business deal with your new ‘friend’ overseas. His fee is high, maybe 6 figures, and he has asked for 50% of it upfront, in cash. He arranges for one of his ‘business partners’ to meet you in your city to collect the cash. How does he do this? If you live in or near most large cities, it is likely to have a sizable population of Africans. Even Malaysia (particularly Kuala Lumpur) has many Nigerian scammers, often visa overstayers. The Scammer will hunt through his family, friends, and fellow Scammers, trying to locate someone near you who will partner with him in robbing you. This third party must be considered trustworthy. Sometimes, the job is sub-contracted to another scam gang, local to the Victim. This is a fraught and difficult decision for the Scammer back home, as thieves steal from thieves and he is risking being turned over by his peers. In addition, the weaker his standing or relationship with the distant scam gang, the higher their cut is likely to be. Where the Scammer does not have a trusted contact near the Victim, pressure will be put on him/her to travel. This could be to a distant city or even another country. A favorite but rarely-honored request is for the Victim to travel to Africa. Gold Scammers prefer this, encouraging the Victim to ‘visit their mine’. Anyone falling for it will be lucky to escape with their life, and only after their belongings have been rifled through, all of their possessions taken, and their bank account milked online. Amsterdam is a favorite location for West African Scammers, as it is a convenient, direct flight destination from their home airports. Drugs, prostitution, and petty crime are prevalent there, creating an environment that is comfortable for Scammers to operate from. The Eastern European Scammers also have Global connections, with Western Europe rife with them. EU border controls (or lack of them in the views of many) have enabled these miscreants to spread widely, with numerous European capitals thick with Romanian pickpocket gangs, IE, Barcelona, London, Madrid, Paris. They also specialize in fake vehicle Listings on eBay, Amazon, etc. It is a chilling thought that these dangerous, lying, cheating thieves who infiltrate our Inboxes with their lies and deceit may have friends living in YOUR Street. 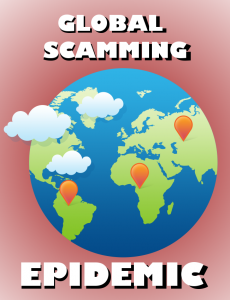 The message to you is not only to be aware, but to BEWARE of the global spread of internet scamming.